This is a sponsored conversation written by me on behalf of McCain Foods. The opinions and text are all mine. 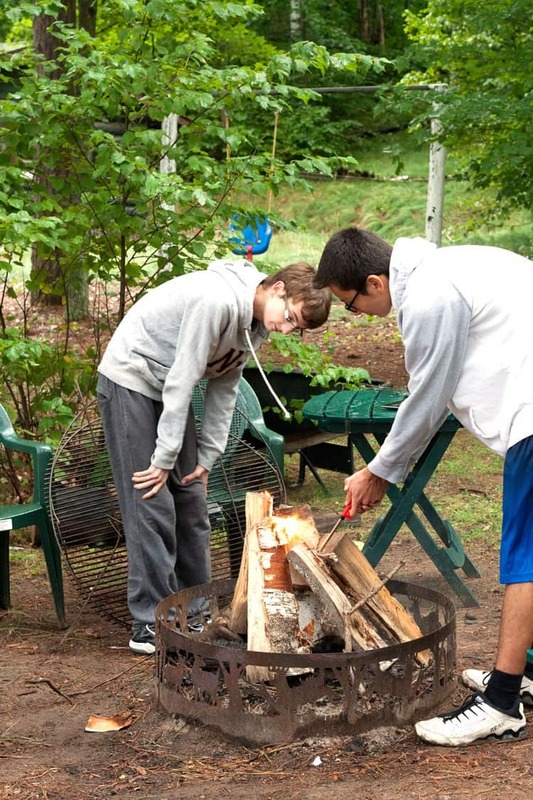 Backyard campfires are just a fact of life once it gets warm enough to spend the day outside. And life in the Midwest means taking advantage of each and every opportunity we have to engage in the bright outdoors. 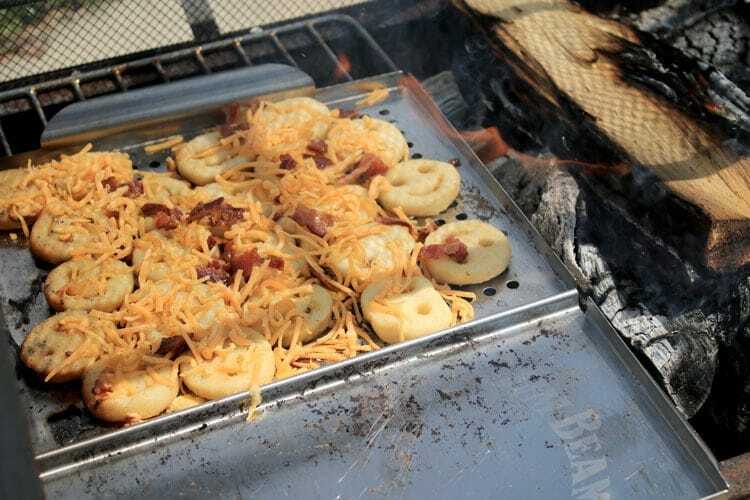 Sometimes that even means cooking on the campfire (like with our Campfire Loaded Fries), but at the very least it almost always involves dining outside with the family. Seriously…when we’re under freezing temperatures for a good 1/3 (at least) of the year… we really appreciate a good warm up. We only hope that it lasts longer than it takes to inhale and enjoy that moment of sunshine. See, here in Wisconsin, we can have chilly weather even in the middle of the summer. This was taken a couple of years ago in August up in Northern Wisconsin. We had some warm weather days, but you better believe I carried a sweatshirt around with me the entire time–because I know from experience that it can cool down quickly. As it gets warmer outside, we’re typically pretty busy. I like to save time in the kitchen with quick, easy meal ideas that keep the house cooler and let me stay outside as much as possible. That’s why I was so excited when I saw McCain Smiles at our local Pick ‘n Save. I knew I could create a tasty and easy recipe perfect for a summer side or snack. 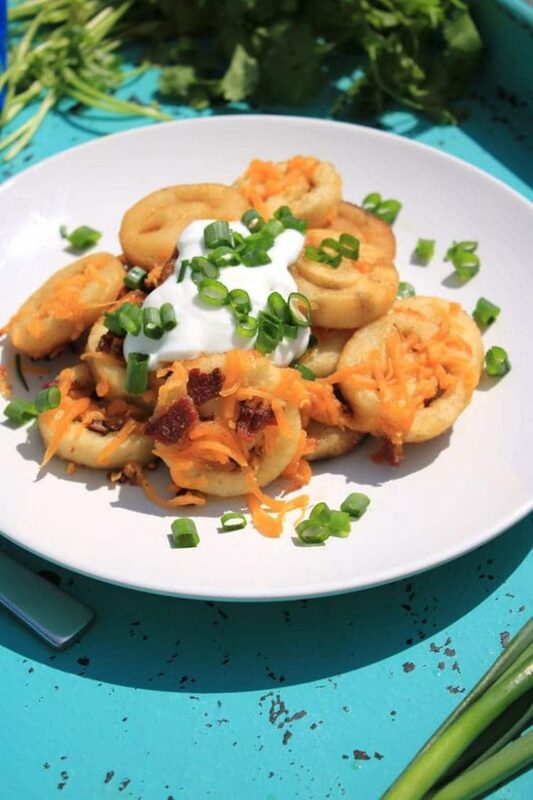 If you love potatoes and bacon, this recipe is for you! The key to these Campfire Loaded Fries is the campfire. You’ll end up with a lightly toasted flavor slightly reminiscent of roasting marshmallows–strictly for the smoky flavor. It’s a new twist on a classic loaded French fries recipe that you’ve possibly tried before. 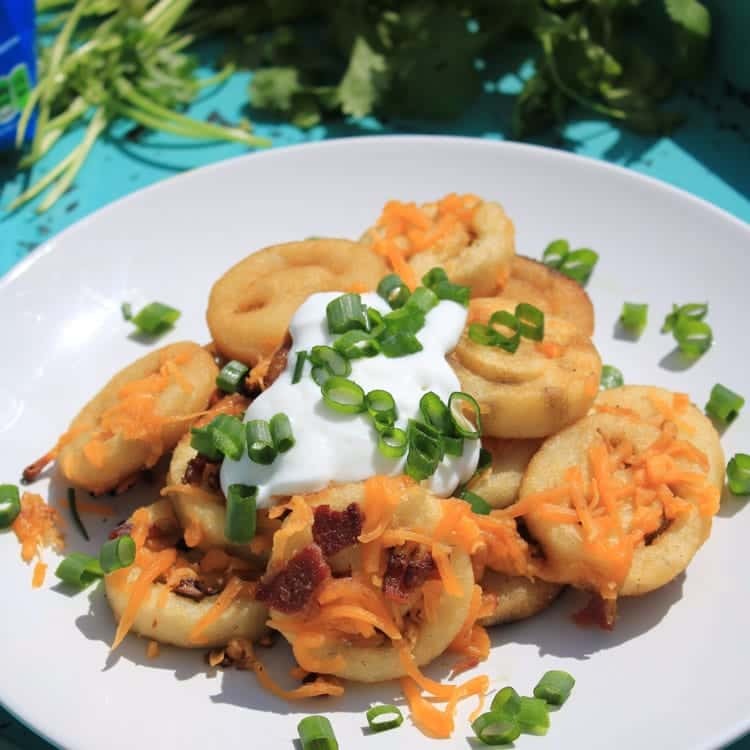 Simple ingredients keep this recipe something that you can likely whip up by pulling a package of fries out of the freezer, and some bacon, cheese and sour cream from the fridge. We normally have all of these staples on hand. I started off with a thin layer of cheese and cooked the bacon inside in the oven. You could definitely cook bacon over the fire as well…you’d just want to do that first so you’d have crumbled bacon to add to the potatoes. After the first layer of cheese melted, I added a thicker layer of shredded cheddar cheese AND the bacon crumbles. Because, well…bacon. It’s hard to go wrong with bacon, right? Dished up, this meal looks like pure perfection. I’m a sucker for anything laden with green onions and sour cream, so it was only natural that would end up being the topping of this delicious concoction. And, if you weren’t smiling before, take a look at all the fun Smiles before you dig in. Let me just tell you–this is a fun treat for kids of all ages (41 included) to eat! 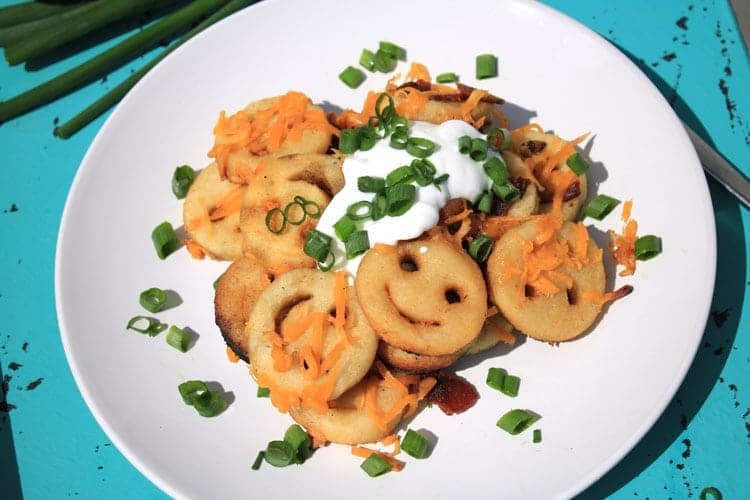 Seriously…we’re talking about mashed potatoes in the shape of smiles. Isn’t that just about the perfect idea for kids? I’m pretty sure they would make just about any young kid grin and giggle. It’s the perfect time of the year for outdoor fun. For us that consists of gardening, bike rides, and time on the water. 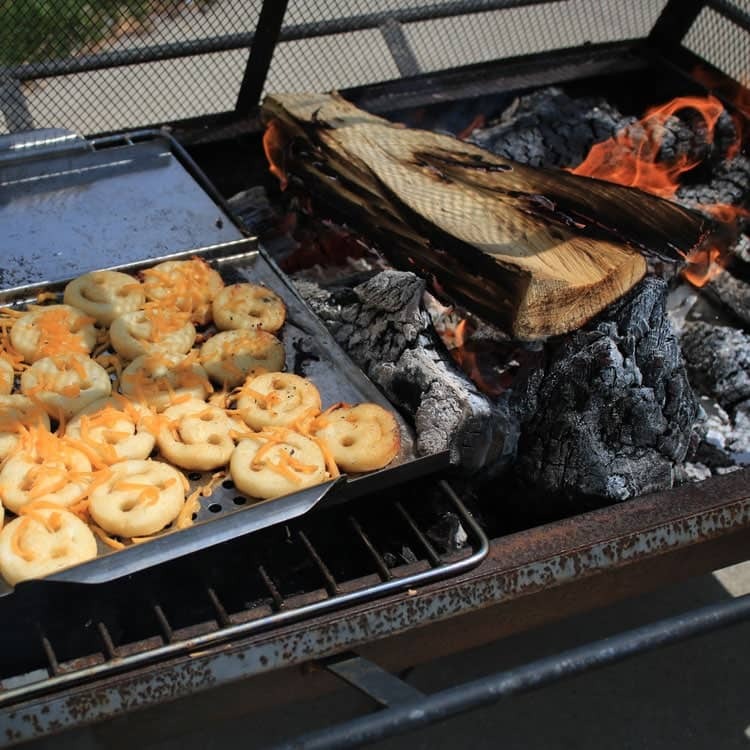 And, there is no better way to enjoy the warmer weather than sitting around a campfire with family or friends enjoying a nibble or two of a tasty recipe. How does your family make the most of summertime together? 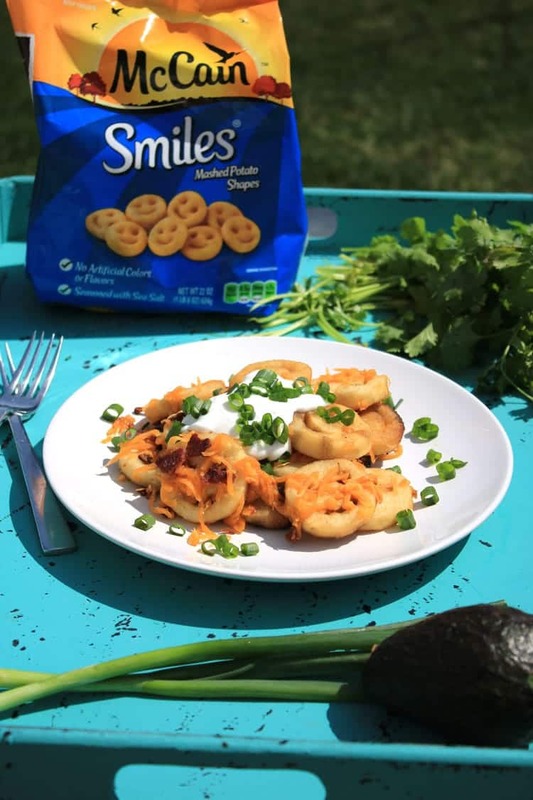 Spread McCain Smiles on a grilling pan and top with thin layer of cheese. Heat next to fire (not directly over open flames), turning pan as needed to distribute heat evenly. Cook for 5-7 minutes. Add remaining cheese and crumbled bacon, heating for additional 10-15 minutes or until heated through. You will need to keep an eye on the loaded fries and adjust cooking time if needed.